Bandhan Bank CIF Number is a unique identity number to know customers details. 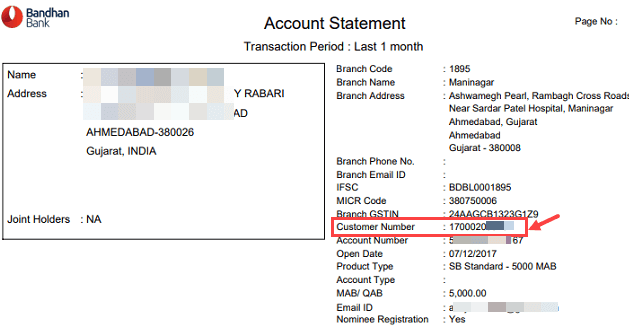 When you open an account in Bandhan Bank, you will get your CIF number and account number. CIF number required when you activate net banking & Mobile Banking facility online. If you are existing Bandhan Bank customer and unable to find your CIF number then here we will tell you two methods to know your Bandhan account CIF number. 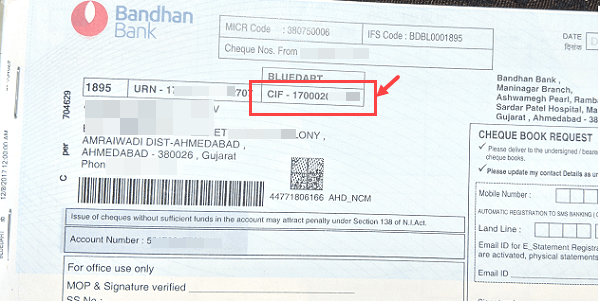 You can check your Bandhan Bank account CIF number on your Cheque Book. After opening account, you will receive personalized Cheque Book within 15 days via post. In this Cheque Book, open the front page where your account details are printed. Your CIF number also printed here as you can see below screenshot. You can also find your account CIF number in the statement PDF file. If you have registered your email address with your account then you will receive monthly e-statement from Bank to an email address. In this e-statement, you can find your account CIF number. Open statement PDF file and where Customer number is your CIF number. Bandhan Bank also provides physical passbook facility. If you have physical passbook of your account then you can also check your CIF number on passbook front page. You can also call Bandhan Bank customer care number and ask your CIF number to the representative. Please call from your registered mobile number. So by following these four methods, you can find Bandhan Bank CIF number.